Stretch Armstrong World is the one and only original first website with the most complete information on the vintage stretch action figures. Stretch Armstrong World is a privately owned website. Use of any and all pictures and information is strictly prohibited unless otherwise granted by The "Stretch King". Welcome to Stretch Armstrong World.The original one and only website totally devoted the the cornsyrup filled he man himself,The Legendary Stretch Armstrong Action Figure. I opened this site for all you stretch nuts out there like myself who are crazy about these highly collectable stretch figures as I am.Of course all the stretch versions will be included here like the Super Holy Grail Denys Fisher Stretch Hulk, Stretch Serpent, The Octopi Siblins, X Ray, Monster, and dont forget the very scarce Mego Elastics! Few poeple realize just how many Stretch Figure versions were actually produced. An estimated 67 different versions from Japan, Germany, Italy, France,Australia and other countries all took part in there own versions of the Armstrong and Monster. 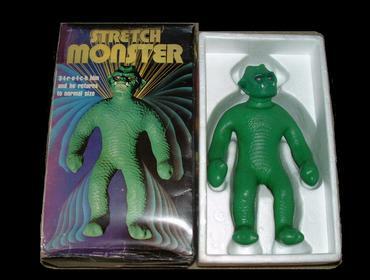 But Companies such as Hasbro,Justoys and Cap Toys produced their own unique Stretch Figures like Stretch Mask, and the most recent 1993 Stretch Armstrong. I started collecting these awsome stretches 10 years ago and now I have the Largest most complete Stretch collection in the world as you will see on this site. Stretch Armstrong figures are highly collectable, very valuable,and unlike any other action figure because they are filled with corn syrup are very unique.I happen to be the utmost authority on Stretch Figure Preservation and have devised several methods of this preservation process I will share with you on Stretch Armstrong World.These 4 easy preservation steps will make it possible to maintain your stretch figure for another 30 years and beyond. The original Stretch Armstrong figure idea was concieved by a CPG employee named James O. Kuhn in 1974. Kenner did not actually recieve a patent for the figure untill 1979. From 1976 to 1979 Kenner made over 50 million dollars on all the stretch versions,and was the largest buyer of cornsyrup over those same years .There were 40,000 Stretch Armstrongs produced by Kenner in the U.S. between 1976 and 1979. Thats not really that many if you think about it especially since 99% of them were ripped apart and thrown and never made it past Christmas of 1976. That means out of the over 300 Million people in the U.S. roughly every 7,500 persons would have to share only one Stretch Armstrong figure! There have been only about 170 Stretch Armstrongs that have appeared in the last 10 years in varying conditions and only about 50 in clean to near mint condition.There are even fewer of the other versions like Stretch Batman or Plasticman of which there are only 1 or 2 left in existence today.Most of the stretch figures you will come to see on ebay and various places are in very bad conditon with leaks,holes and unrepairable damage. Thats gives you an idea of just how rare these stretches have become. Only a handful are left today,only a handful.Stretch Armstrong numbers are still declining each day as their owners dig them out of the atticks and basments after over 35 years only to bend them or stretch them to ruin while learning after just how much their stretch arsmtrong figure was worth. The cornsyrup was condensed to just the right viscosity to make the stretch return slowly to its original position as the latex skin reacted against this highly viscosic goo. Collectors of these figures are very aggresive and determined because they know with such limited numbers remaining that at any time they may be all gone. This can make finding the one you want more difficult yet more fun too. Afterall the fun is always in the hunt, right? It took me 4 years to find the Stretch Serpent! One can only know how much fun collecting stretches can be if one becomes as obsessed as I have become.Stretches are in a class all by themselves and their value has remained more stable than Gold making them a truely great investment! Get ready for a look at Americas favorite then and now action figures. Be very carefull, or you just may become a Stretchy! Your Entrance to My Stretch Kingdom is now Granted, For I am,The Stretch King! Go to top of this page for page tabs. Although I strive to give as accurate information as possible from the most reliable sources, It is possible that some information may be inaccurate and should not be deemed fact unless verified directly from the source.In no way is the information on this website an attempt to infringe upon the Copyrights of any of the toy manufactuers or any other person, company or business mentioned, ie Kenner, Hasbro, newline Productions Inc.,Toybiz,Character Toys, Sulc Toys,Square Traders Publishing,Mecanno,Denys Fisher, Disney,Mego Etc.The information and pictures on this site were obtained or submitted by persons as permissable use as well as from public locations not requiring permission to display or copy and remain the sole property of their respective manufactuers.Companies or persons and can be removed upon request of the same via my email address located on this website.Any and all pictures on this website taken by Simone Bonda or Tony Galla (Stretch King)are the sole propety of Stretch Armstrong World requireing permission from the same to be transferred,copied or used for any other location besides Stretch Armstrong World.